I am a lover of all things pickled... growing up around old world Italians our neighbors pickled every vegetable they grew in their gardens: eggplant, peppers, cauliflower and of course, cucumbers. 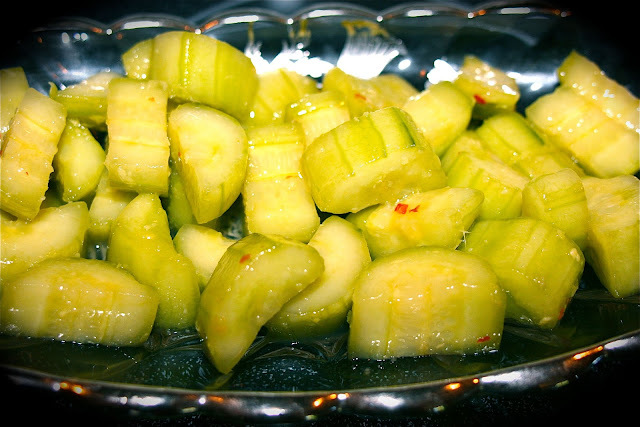 Now I have not been partially adventurous in my pickle eating, our babysitter raves about how delicious deep fried pickles are, and I still have not consented to my kid's making kool-aid pickles or "koolickles"... as they are called, yeah - they are a tradition in Mississippi, but we live in New York. Well Dorie's pickles were truly simple to make... (thank you, it has been a busy week.) and my family and I were excited to share them with old friends who were in town, sadly to sell their house. Opinion on the pickles was: 3 OK, 2 "loved them", and 2 "too much ginger." I thought these were nice, but I can see where it might be a bit too much ginger for some. 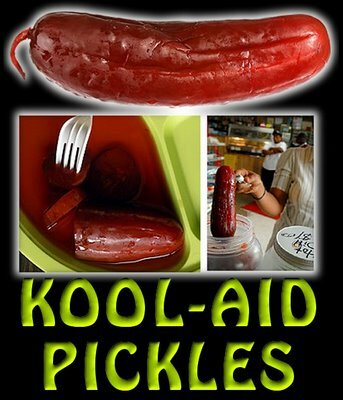 I don't think your missing out... kool aid-pickles are definitely on the yuk side. I liked this cucumber recipe, too, Diane. I am really not a ginger fan but we went easy on the ginger. It's just such an easy and simple side dish and could be chopped up finely to work as a topping on sandwiches, hamburgers. Who doesn't have an extra cucumber lying around. Thank you so much for your kind and caring words regarding Michael. Tough week but we're doing well as we head into the week-end. I will definitely make these again with less ginger. I love your idea of using it as a sandwich topper. Gunna try kool-aid pickles? Kool aid pickles are new to me and I don't think I'll be investigating! We liked these pickles but we like ginger. Less ginger would probably be great too. I'm not going there either.. not a fan of Kool-aid anything. I like ginger too but I couldn't taste the cucumber... but my husband was with you. YOur road trip sounded fun... surprised you didn't find any kool-aid or deep fried pickles on the way.